2-19-18 At SOCALNSTRA, Missy got 1192 points for 7 points and 6 retrieves in 30 minutes on 40 acres. She actually pointed 8 but one was 3 ft out of bounds. 8 birds were take out of the field in the previous brace. I didn't think there was a bird build up, but apparently there was. Her Brace mate found 4. Weather was 20 degrees with wind chill of 6 degrees and snowing. I judged the prior day for 9hrs on a quad.. This was in sunny California. Do we call this fun?? You Bet!! Congrats, good job! It makes all the headaches worth it, when your dog puts it all together. Aweome job. Dogs got a nose. 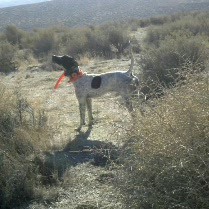 We struggled during quail season to get enough dogs. We always need dogs, come on out. Congrats on the great run! After nine years in NSTRA I'm still waiting for a run like that. Been out of NSTRA a long time but thinking about doing a little again. Seven find's is a super run! Something wrong with NSTRA just might be the rule you can't point a bird out of bounds If the bird is out and the dog in, why shouldn't it count? Every dog down has the same chance of pointing an out of bounds bird. I would live to see someone explain to a dog the out of bounds rule! Actually I'm thinking about getting back in and having my girl friend run my dog's and I'll tag along and watch. Gonna teach her to shoot a shotgun when the weather clears. She shoot's rifle's and handguns. I can understand what you are saying about a dog in bounds pointing a bird out of bounds. But you have to draw the line someplace. Would it be much different if the bird was in bounds and the dog was out of bounds? NSTRA just decided to make the rule that both the dog and the bird must be in bounds. In 10 years of running dogs in NSTRA I have maybe seen the situation you describe once or twice so it's really not a big deal. Thus I don't believe there is anything wrong with NSTRA because of this rule. I have had birds out of bounds twice in my short time doing NSTRA. This year I think the snow gods are watching our schedule. Last month, the camp area was a mud bog. Had to have my rig towed in. Mud slop and snow both days. All month, fairly good weather. Last 2 days record rain fall and freezing snow on Friday night. Just in time for our 9-10th trial. This is going to be a bumper quail year for CA. Seeing pairs all over the desert by my house. Love it.